The UO Cinema Studies Department is pleased to offer a new kind of new media laboratory, open to anyone in the university community (students, faculty, and staff) for digital editing and image creation. On the second floor of Knight Library, the lab is available seven days a week (and well into the night) during the academic year for students, faculty members, and instructors with the need to cut, tweak, filter, and deliver any type of project involving sound and picture. For your production needs, the lab is stocked with 27-inch iMacs fully loaded with Avid Media Composer 7.0 (the TV and film industry standard editing software), Apple’s Final Cut X, and Adobe Creative Suite 6 including After Effects and Premiere. Computers: 24 student and one instructor Intel Core i7 27” monitor iMacs. Computer Specs: 3.4GHz processor, 8GB RAM Memory, 1TB internal hard drive. Computer Inputs: SD Flash Card, 2 Thunderbolt, 4 USB 3.0. ***Please note that the new iMacs do NOT have CD/DVD drives, but we have 3 Apple Superdrives in the lab that students can use with their student IDs. Media Production Software: Avid Media Composer 7.0, Final Cut X (including Motion and Compressor), Adobe Creative Suite 6 (including Premiere, After Effects, and Encoder), DVD Studio Pro, Soundtrack Pro, VLC Player, Quicktime, and MPEG Streamclip . MS Office Room A/V: (2) 50″ HD Plasma monitors. Laptop connection (with 3.5mm audio jack). Room’s A/V controlled via Crestron touch panel. Additionally there is a 28-seat exhibition screening area with HD offering DVD, Blue-Ray and instructor computer screening. Scanning: The lab has an additional computer used for scanning only and has no software on it. Note: If you work on projects in the lab, you must work from or save to an external hard drive because once you log out the computers automatically wipe all work. No food or beverages are allowed in the computer lab space. Only licensed software may be installed on these computers, and students cannot install software or plug-ins. A standard suite of software is installed on these computers that is intended to serve the needs of most groups using the classroom. Requests to install software must be received at least four (4) weeks prior to the start of the academic term. Additional software requests are submitted for consideration. Please contact Dr. André Sirois, Multimedia Specialist/Lab Supervisor at cinemmsa@uoregon.edu regarding adding new software to the lab for a specific class. Visit the Cinema Studies Technology Resources website for information on working with media in the Cinema Studies Lab. Where in the world is the Cinema Studies Lab? 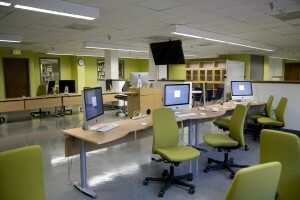 The Cinema Studies Lab is located on the seond floor of Knight Library in room 267. For UFO club member use of UFO equipment, please visit the UFO Equipment page.